Know a Doc McStuffins fan? The doctor is in with this play set we found on Amazon!! Hurry and get the Doc McStuffins Hospital Doctor’s Bag Set today for $19.99 NOW only $13.48 from Amazon! Pretend play as doctor or patient on this cute doctor’s kit. Check out all of the Amazon deals here! Shipping may be delayed a few days. Once available, Amazon Prime members get FREE 2-day shipping!! If you are not a Prime member, get FREE shipping when you purchase $25 or more of eligible items across any product category. Your stuffed animals and toy friends are ready for their check-ups! 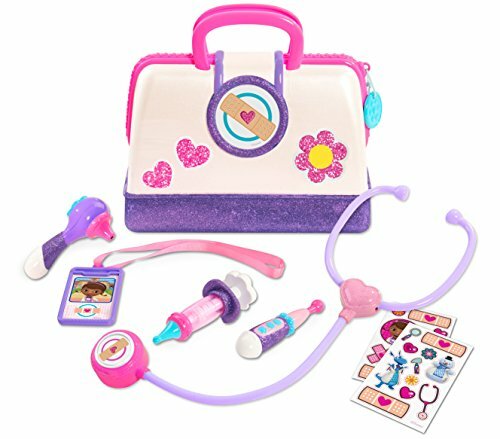 Disney Junior’s Doc McStuffins toy hospital doctor’s bag set includes a new and improved doctor’s bag, syringe, otoscope and thermometer. Of Course, Doc’s magical stethoscope is included featuring sounds and light-up. Now your little Doc can “practice” her skills and nurture her favorite toys back to perfect health. Requires 3 AG13 batteries. Who’s ready for a hospital checkup? Buy the Doc McStuffins Hospital Doctor’s Bag Set from Amazon. Next articlePop-Tarts Deal!! Frosted Strawberry and Frosted Brown Sugar Cinnamon!